I have been stalking this huge glass jar for a while now. Isn't she lovely? I first saw one like this at Crate and Barrel, but didn't want to give up my first born to pay for it. But, a couple months back I happened to stumble upon the VERY same jar at, of all places, Wal-Mart. It was only $12.97, and still I begrudgingly passed it by. I have a rule that I cannot buy anything unless I know what I'm gonna use it for. Everything I bring into this house needs to serve a purpose, not just sit in a closet unused until I find somewhere for it. (p.s...that rule gets broken sometimes) But I digress. Sooooo, most of you know of my unhealthy addiction to ribbon. It started small, but soon got out of control. My ribbon collection was taking up an entire drawer in my kitchen buffet. Now, I have to be honest here...it was really fun to have my very own ribbon drawer...FULL of fabulous ribbon. Sometimes I would just open it up and adoringly look through my stash. I know...I'm weird. But that ribbon drawer's first intention was for some of my extra craft supplies, and they got kicked to the curb pretty quick and became homeless...(cluttering up my bedroom). I live in a smallish house with a family of 6...I have to be extremely creative in my storage solutions. So my beautiful ribbon found a new home in this very large glass jar, that is basically just asking to be broken by my rough and rowdy children. I'm willing to take that risk...I'm living on the edge, I tell ya! These 5 gallon size bags were filled with ribbon. I still have more to put in the jar...shhhhhhh. This thing is ginormous. I believe it holds 3 gallons. And for a toally random ending to this post...I got this lovely hand towel at Target today for $1.24. It is their Fieldcrest brand and the original price was $9.99. I thought the damask pattern was beautiful and the color matches my bathroom perfectly. I love it when that happens! Anyway, I'm off to bed...gotta get up early for the yard sales!!! Ok, y'all know I love me some ribbon, right? Well, guess what I love just as much? They can be the crowning jewel to any room. I LOVE to add big fat lush ribbon to really make them feel special. And if you want your lamp to get a big ol' boost of confidence...pin on a brooch. P.S...they sell them at Hobby Lobby just like this, all dolled up, for big bucks. But I'm here to tell you that you can fashion you own creation for much less. Be on the lookout at yard sales and thrift stores for neutral shades that can be embellished and pretty shapes of lamp bases. It doesn't matter what color they, as long as they have a beautiful shape. You can easily spray paint them ANY color you want. And when you get tired of them...spray paint them again with no guilt or regret. Don't be afraid. It's your home...do what you love...love what you do! You can dress them down. Or you could hot glue some leftover trim on there and pin on a vintage brooch. Nope, changed my mind...I think I like it in the middle better. Personalize a plain white shade with a little ribbon glued on the edges and a scrapbook flower and button in the middle. Take a plain paper shade from Ikea and customize it to match your nursery with leftover fabric. Then cram all the extra stuff in a closet for a rainy day. Let's see...there's 2 brass lamps ready to be painted, 3 extra shades you bought for a song on clearance at Lowe's (less than a dollar each), crystal chandelier candle holder thingy from a yard sale, spinning Buzz Lightyear lamp, and the most adorable denim drum shade that is waiting on one of those brass lamps to be painted. Ok, now that I see it all, I think I might have a problem. Like I said before...I love lamps. Now head on over to Nester's Lampapalooza Party and check out some more lamp inspiration. Trash to Treasure Project..Half Finished...and Late to the Party! Yes, I realize that this lovely shade of peach is sooooooo 1987. In fact, I remember this very color being my absolute favorite back in the day. I wanted my future bridesmaids dresses this color...my first house this color (with green shutters no less). Let's just say peach was the IT color. Nowadays, I'm a little less inclined to peach and more into neutrals. I saw this cake stand at a local salvage store recently and fell in love with it. Those beautiful fluted edges had me at hello. The color didn't bother me one bit, cause I knew I could spray paint it any color I fancied. Oh, the wild joys of spray paint!!! You can still see some of the peach peeking through the white. It has rained almost every day this last week, and I've not been able to get the last coat on there. Even unfinished, I think it is lovely. I'm envisioning a cute little nest with a glass cloche on top. The ideas are endless for this beauty. I always love to hear your input and ideas...sooooooo...what would you do with this frilly dilly cake stand? For more Trash to Treasure, visit my friend Kimm at Reinvented. Hello Ladies! Say hello to the new and improved Crocs. No more duck feet...thank heavens. Really, I can't think of anything uglier than those blasted shoes. Now don't get your feathers ruffled...there is a time and a place and an appropriate age for them. If you are a gardener, going to the beach, or younger than 10 years old...it's ok to don duck feet...sort of. I will admit that I own a pair of crocs, but they are the flip flops and much less offensive...really. So, you can imagine my surprise and delight when I checked my e-mail today and found these little cuties staring back at me. If you order them through Piperlime you get free shipping. I think they would be super cute with bermuda shorts or jeans for the summer. They are in fact plastic, so I don't reccomend them for anything remotely dressy. But if you want a fun, stylish look that is also really comfy...I think these would be great! I am dying to order a pair. Which one do you like best? I had big plans this week, people...BIG plans! My husband and two oldest children went to Cape Canaveral Florida to see the space shuttle Atlantis launch. They are gone the whole week. I had all these grand plans of everything I would accomplish while they were gone...HA! I've done nothing. I wanted to paint my kitchen and laundry room cabinets black. And I had every intention of doing it. That is, until I went to Lowe's Monday afternoon with 2 whiny toddlers and got totally overwhelmed by paint choices and the incessant crying coming from my darling children. Ok, scatch that...let 's go see what the laminate counter tops with the "fake granite look" are like. Maybe I can get my contractor friend to do that for me this week. We get to the back of the store and the whole aisle is jammed with trash and pallets of boxes and several employees who don't seem willing or eager to move the crap out of my way. So I wiggle my way in around the crap and start looking for the right color. Still no one moves to help me. Just then my 3 year old scales the buggy to climb out and proceeds to sprinkle/dump an entire bag of goldfish crackers all over the floor. Ok, that's it...we're done! I wanted to leave the heap of crackers on the floor for those lazy employees to clean up, but I didn't. I got myself down on the floor and picked up every last one of them. As I was looking around for somewhere to throw them away, one of the workers yelled over..."just throw em in that big bin over there with the rest of the trash". Yeah thanks! I thought you didn't see me, but obviously you did and were just waiting for the right moment to approach me. People like that really get under my skin. Anyway, we left. I think that whole episode must have started off my week on the wrong foot, because since then I have been so UNmotivated to do anything. Well, I guess I did get 2 things accomplished this week. I had some custom orders that were so much fun to create. I forgot to take a picture of this first one before I packaged it up. So this was my lazy attempt at trying not to unwrap it. Yeah, that didn't work so well. I think I can spend an extra 45 seconds to rewrap. I wanted y'all to be able to see how utterly precious it turned out. I mean, come on...who doesn't love toile? Especially soft pink girly toile with nursery rhyme scenes on it! I love the simplicity of this one. I got an e-mail from a girl who wanted me to match her daughter's crib bedding. She told me the name and brand. I googled it and printed out a picture of her exact bedding, went to Hobby Lobby, found a coordinating paper and...VOILA! This one was a lot of fun to create... I LOVE custom orders. I really enjoy putting my own spin on my pieces, but it's neat to work with someone in creating that one of a kind customized piece just for them. So, if anyone's interested...my etsy store is right up there in the top corner, or you can e-mail me anytime. I'm obviously NOT going to get anything else accomplished around the house this week. And I'd much rather craft than paint anyway! "To upcycle is to take a product and reconfigure it into something different yet somehow more useful - generally by hand. Basically, it’s “Frankenstein-ing” seemingly useless stuff into things that are awesome. Upcycling is considered an art as much as it is a form of conservation (or whatever “green” term you would like to assign to it). It generally is motivated more by nostalgia, needs, and creativity than it is some desire to merely save money. That being said, upcycling does really deliver, in terms of cost feasibility; the stuff you’re going to be improving generally will be either something you already own (and were about to get rid of) or something you bought for cheap at a thrift store or swap meet, intending to rebuild it like Steve Austin." Enough with my "green" rant. Here's some of the stuff I scored this weekend. This little black cabinet is in perfect condition and was $3. Ummmmm...I'll take it. I was nervous the lady was going to change her mind about the price. It took all the self control I had not to RUN to the car. Yes, I know...I'm such a freak! Just when you thought it couldn't get any better...there's a cork board on the inside of the door, 2 deep shelves, and 2 little drawers. Oh, and the front of the door is a magnet board that I want to paint with chalkboard paint. (3) 10 x 13 frames in an antiqued silver finish. Only 2 of them have glass, but for just a few bucks I can deal. These lovely frames WILL be spray painted satin black. I have a freakishly long hallway that I'm slowly turning into our family picture gallery. To unify the space I want all the frames to be black. So I'm collecting them here and there when I can find them for CHEAP and going to town with the spray paint! 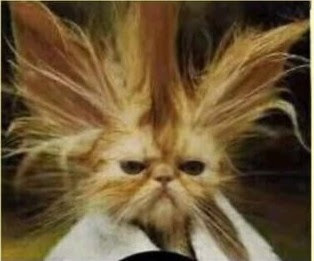 Ok...scary kitty picture. No, I do NOT have kitty collectibles. But I thought these would be ADORABLE with my vintage inspired Halloween decorations. I am ALL about decorating for Halloween. I CAN'T WAIT TILL OCTOBER! And last, but CERTAINLY not least...we have this beautiful, sparkly, gem of a yard sale find...$2. I am planning on hanging this little treasure in my girls' room. I mean really, how CUTE is that? Now hop on over to Ms. Rhoda's place and check out all the yummy yard sale goodies everyone scored this weekend. You might just decide that you want to join in on the fun too. And let me tell you...once you go cheap, you can NEVER go back. 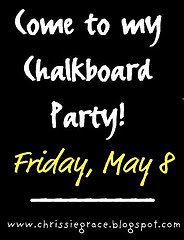 Today I'm linking up with my friend Chrissie Grace for her Chalkboard Paint Party. There are sure to be lots of great ideas and new inspiration for using that chalkboard paint you may not know what to do with. My project is pretty standard...you've probably seen it done before. Even in it's simplicity, I still think it's pretty great. Chalkboard paint is super easy to work with and very hard to mess up. That's my kind of project! This painting is really not all that bad...it just isn't really my style. I actually had it hanging in my kitchen for a while, but never really liked it. While perusing the "oops" paint table at Lowes, I came across a can of chalkboard paint for $3 and could not pass it up. I'd always wanted to try it, so I thought I'd give it a whirl. I used a foam brush to paint directly onto the top of the actual painting. I think I gave it 2 or 3 coats and let it cure for a day before writing on it. Really...it doesn't get much simpler than this. As you can see I did rough up the frame a bit with some sandpaper. Then I rubbed some antique white craft paint onto the beaded detail so that it would stand out more. I love to put a new message on their for each holiday. It's a fun addition to any holiday decor. This is a simple project that anyone can do. Now, I just had to give a little shout out to a new bloggy friend and fellow etsy shop owner Jeanette at Splendid Things. She made a purchase at my etsy shop, which she found through another blog. After I received her order I hopped over to her shop and found this precious tea towel that I just couldn't live without. This is one of the neatest things about blogging to me. It brings people together in so many ways. I have met so many wonderful and inspiring women since I started blogging. The friendships I make each and every day with all of you mean the world to me. I am a better person for meeting y'all. I love this network of women supporting women. In the real world we have so many things dragging us down and making us feel like we're not good enough. But when I sit at my computer every night, something miraculous happens. I don't feel the weight of the world on my shoulders. I don't feel like I'm not good enough. Quite the opposite in fact. I feel like I AM someone who is worthwhile. I feel lifted up by these amazing women who support and love with no strings. What an awesome gift that is. So, I want to say thanks to all of you. Thank you for being here. Thank you for your friendship. Thank you for your support and prayers when I've needed them. Thank you for just being YOU. I am truly blessed to count you as my friends! My new and ever so loverly black trays for holding craft supplies. I put some buttons on there to show y'all what they will look like when they're full of embellishments and trinkets galore. I am so pleased with how they turned out. I went back and forth trying to decide whether to paint them black satin or heirloom white. My final decision was based on the fact that my new workspace (all in my head at this point) will have white walls, white beadboard, white shelves, etc. I'd like all of my accessories to be black and white with a dash of color thrown in here and there. Now, for those of you wondering how I did this...it was quite simple. First I wiped them down with a tack cloth. Then I applied a thin layer of spray primer...Rustoleum Painter's Touch White Primer. Next, I used Rustoleum Satin Black and applied several thin coats. Be sure and wait the appropriate amount of time between coats. Tomorrow I will put a couple clear coats on top for added protection and hopefully to prevent scratching. I am thrilled with the outcome and can hardly wait to use them in my new workspace. I think they will add just the right touch of whimsy, personality, and uniqueness! Plus...they will be super cute paired with my new dress form! Just a quick post to let y'all know about some super deals at Hobby Lobby. And my condolences for those who unfortunately do not have access to the fabulousness that is THE HOB LOB! There is a whole double sided isle with 50% off home accents. Now, normally this wouldn't be a big deal because this stuff goes half off all the time, right? Well, in said isle there are some beautiful birdcages. They have 3 sizes...small, medium, and large...in both black and white. Remember the one I was soooo excited about getting for half off? Well, I found out later it was NOT supposed to be included in the half off sale. They made a booboo. But now those same ones are all marked down... and they are beautiful...and I think everyone should own at least one birdcage! I had to let my bloggy friends in on the deal. When I saw this beauty marked down to 9.99, I knew she had to come home with me. And of course I had to add a little ribbon belt to her waist...perfection! My plan is to put this on the desk of my new workspace, that is, if I ever finish it. Another one of those summer goals...I have grand plans. We'll see if I can make it happen. Can I count on y'all to keep me on track? Thanks...I need all the help I can get! 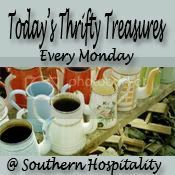 Today I'm linking up with Ms. Rhoda at Southern Hospitality to share my yard sale goodies. Yesterday was a very good day, and the sales were abundant! I hit a neighborhood sale first thing and went to about 12 or 13 in one stop...love that! In fact, there were so many I could have spent the entire day and still not gone to half of them. It rocked! This was my first purchase of the day and my biggest ticket item at $30. It is almost brand new and the battery actually works and came with a charger. Now, I've priced these and they are $200 plus. The battery alone costs $50, so I think I got a pretty good deal. Y'all know my affection for Yellow Box brand flip flops and sandals, right? This is my 6th pair. I only buy them when I can get them half off. But yard sale prices beat that by a mile! My best friend has this exact same pair and she paid $45 for them. I paid $3. They look almost new...very gently used. Nope,I'm not above wearing used shoes. Plus,do you see all that bling on the top? A tiered tray to match the one I got at the yucky thrift store...75 cents. Gymboree outfit for the Fall (that top is corduroy...cute). Smocked froggy ballerina capri set. Could you just die? A pink tweed dress for my one of a kind 3 year old! And a Straussburg dress (retails for 60-$70)...$2.50. No, I did not purchase this adorable little girl from a yard sale, but sometimes wish I could sell her at one! (totally kidding, people). I cannot get a picture of her with out that stupid glare from her cuite patootie glasses. Oh well. Even though she looks like she has an eye patch, she's still precious! What awesome finds did y'all score this weekend? Thrifting is a Dirty, Dirty Business!